What’s the Best Choice - Roomba 860 vs Roomba 880? In this review, we are going to pit the Roomba 860 vs 880 to see whether their difference of over $100 in price is justifiable. Both the Roomba 880 and Roomba 860 are among the best vacuum cleaners in the renowned Roomba 800 series. Unfortunately, production of these two vacuum cleaners was discontinued and this is why you won’t find them on the iRobot website. However, they are still in stock and still dominant just like the rest of the Roombas. In this Roomba 860 vs 880 comparison review, we are going to examine these two Roombas in detail and see what makes them similar as well as their difference. If you are looking for a midrange Roomba and you are torn between the 880 and 860, you’ve come to the right place. So, without further ado, let’s get straight to today’s business but just before that, a review of the individual products including their pros and cons. Similarities; What Makes the Roomba 860 Similar to the Roomba 880? Differences; What Makes the Roomba 860 Different from the Roomba 880? What’s the Best Choice; Roomba 860 or Roomba 880? The Roomba 860 is among the bestselling robot vacuum cleaners in the Roomba 800 series. This cleaner is liked by many because of its versatility. It can work on floor types and delivers quite some good performance on carpets and pet hair cleaning. Just like all the Roombas, it has been equipped with a 3-stage cleaning system which brings on board a new debris extraction system and a Gen 2 motor for stronger suction power. When it comes to its movement and navigation, the 860 is not the best compared with the 900 series but again, for such a low-budget Roomba, I can’t complain. It stands at 3.6-inches and has strong off-road wheels for easy maneuvering under furniture and other household furniture. The 860 uses the native iAdapt 1.0 navigation system that is quite impressive compared to the earlier Roomba models. Even though it is not as precise and accurate like the iAdapt 2.0, its precision and accuracy are commendable. The best thing about this cleaner is the Virtual Walls for restricting it to certain areas. Other great features of the 860 include a powerful battery, self-docking, 7-day programmable scheduling and many others. Here are its notable pros and cons. Versatility – This Roomba can clean a range of floor types including hardwood, tile, linoleum, vinyl and even carpet floors. 5x the Air Power – The Roomba 860 has been optimized to deliver 5x the air power in normal cleaners for stronger suction. Better Cleaning – The Roomba 860 delivers exceptional cleaning performance. Boundary Marking – Unlike many of its competitors, the Roomba 860 comes with Virtual Walls. Long Battery Life – This cleaner has been built with a high-performance and durable battery that has twice the life cycle of ordinary batteries. Affordable – The Roomba 860 is very affordable considering its excellent performance and more so, for a Roomba. Lacks Wi-Fi – For such a great Roomba, Wi-Fi would have made it better and able to compete with other cleaners with the same. 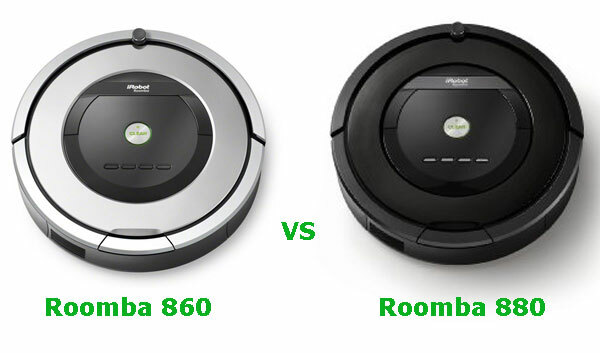 Navigation – Compared to the 900 Series, the Roomba 860’s navigation is not so impressive. Bottomline – The Roomba 860 is a great robot cleaner that has been built to offer great service and durability. It also packs some unique features like Virtual Walls and Dirt Detection which makes it such a superb cleaner compared to its competitors, the likes of the V3s and ECOVAS N79. The Roomba 880 marks a major shift in technology as far as the Roomba series is concerned. This vacuum cleaner can clean all floor types, from hardwood to vinyl floors. It packs the highly efficient 3-stage cleaning system that has an all-new extractor design. Unlike the previous models that used dual multi-surface brushes, the Roomba 880 has rubber extractors. To ensure high suction power, the 880 has a powerful motor that works on low-noise making it a great cleaner with very minimal disturbance. It also has the advanced Dirt Detection Series II that works to make sure the cleaner focuses more on areas with a lot of dirt. When it comes to maneuverability and navigation, the Roomba 880 has a low-profile design to enable it to creep under furniture. Standing at 3.6-inches, this cleaner can go under beds, sofas, around chair legs and so many other areas that you can’t clean with other vacuum cleaners. In terms of navigation, it still packs the iAdapt 1.0 navigation system. However, it is worthy to point out that the 880 finds its way around the house seamlessly without getting stuck like earlier Roomba models. Superb Navigation – The Roomba 880 uses iAdapt® responsive navigation which is precise and accurate. Rubber Extractors – The Roomba 880 packs newly designed rubber extractors that are more effective and prevent tangling. Advanced Dirt Detection – This technology enables the Roomba 880 to find where there’s more dirt for a concentrated cleaning. Powerful Suction – iRobot included a powerful motor that has been optimized to deliver 5x more air power which translates to more suction. XLife Extended Life Battery – This robot cleaner has an advanced battery that delivers as much as twice the cleaning cycles as is in the previous Roomba models. Quite Pricey – The Roomba 880 is quite pricey considering other options like the ECOVas N79 and iLIFE V7s offer almost the same features. No Wi-Fi – This is another area where iRobot ought to have performed better. Wi-Fi is the new trend nowadays to allow users control their cleaners from the Smartphone App. Bottomline – Even though it is quite expensive, it offers real value for money. The new rubber extractors make it more efficient in agitation. On the other hand, its battery life is quite impressive considering it is a middle tier Roomba. Now that we know a thing or two about the Roomba 860 vs 880, it’s time we compare these two vacuum cleaners before giving our verdict on which one is best. In this comparison review, the best approach is to first look at their similarities and later on, what makes them different. In this segment, we will focus on what makes the Roomba 880 and 860 similar. Our focus will be mainly on the features they share. Having said that, let’s go straight to the features that make the Roomba 860 and 880 siblings. Most dirt hides under beds, sofas, around chair legs, kickstands and other places that are not easy to access. For this reason, robot vacuum cleaners are designed to ensure they can fit under this furniture to clean the dirt that can’t otherwise be reached with handheld vacuum cleaners. iRobot ensured that both the Roomba 860 and Roomba 880 have a low profile design. These two vacuum cleaners stand at 3.6-inches. However, iRobot should have done better considering there are other brands with very thin cleaners that stand at even 2.9-inches. iRobot has maintained its innovative cleaning system over the years. All of the Roombas, including the 880 and 860 use the native 3-Stage Cleaning System that has proved to be very efficient. This cleaning system approaches cleaning in 3 stages; agitation, brushing and lastly, suctioning. In the first stage, the dirt and debris are loosened before being brushed and finally, suctioned into the dirt bin. There’s also a spinning side brush that ensures all the dirt on the cleaner’s path is swept and vacuumed. In terms of cleaning reliability, however, we found the Roomba 880 to be more effective. Both the Roomba 880 and 860 both share the same navigation system. They have been engineered with the advanced iAdapt 1.0 navigation system which uses invisible laser sensors to guide the cleaner around your house. Even though the same technology has been used, we realized a difference is precision and obstacle avoidance. We noticed that the Roomba 880, upon the detection of an obstacle, it slowed down before making a turn. However, when it came to the Roomba 860, it wasn’t slowing down and in some cases; it hit obstacles before making turns. Even though we now have the iAdapt 2.0 which comes with Visual Localization, we find the navigation of both the Roomba 860 and 880 quite impressive, especially in average traffic rooms. With scheduling, homeowners are able to program the cleaner to start cleaning autonomously at their preferred times. This is a universal feature in many robot vacuum cleaners and is part of what makes them be known as robotic vacuum cleaners. Both the Roomba 880 and Roomba 860 have a 7-day programmable schedule function. You can set the cleaner to start cleaning at specific times throughout the week. This is such a great feature considering many homeowners have busy schedules. Most vacuum cleaners have docking capabilities. Perhaps the most important thing about docking is power management. Both the Roomba 880 and Roomba 650 have self-docking, a feature that allows them to manage their power independently. Whenever they run out of charge, these two cleaners will locate the Home Base and go there automatically for recharge. Even though these are the main similarities, it is worthy to note there are many other aspects that these two vacuum cleaners share. In terms of aesthetics, they are both quite similar with minimal differences in the finishing. They also have the same interface; one large ‘CLEAN’ button and four other smaller buttons beneath. Remote controls allow users to control the vacuum cleaner from a distance. Being an elite cleaner in the Roomba 800 series, the 880 has a physical remote provided. However, the 860 lacks a remote control. This is a rather ambiguous difference in that even though they both have Virtual Walls; they are supplied with different accessories. The Roomba 880 comes with two Virtual Walls with Lighthouse. It also comes with three extra side brushes. On the other hand, the Roomba 860 only has a single Virtual Wall. Multiroom cleaning enables vacuum cleaners to clean different rooms simultaneously. The Roomba 880 has multiroom cleaning which uses the two Virtual Walls to make boundaries. This ensures the Roomba cleans the room thoroughly before going to the next room. In the 860, it is a different case. It will jump to the next room before clearing the first. At the end of the day, the house won’t be cleaned thoroughly. These two vacuum cleaners, the Roomba 860 and Roomba 880 have two different battery technologies. While the 860 packs a Lithium-Ion battery, the Roomba 880 has the iRobot® XLife™ Extended Life Battery. Lithium-Ion batteries are known to be very powerful but on the other hand, the XLife™ Extended Life Battery is very durable. The Roomba 860 can run for an average 75 minutes while the Roomba 880 can go for up to 90 minutes. Now that we have seen the similarities and difference of the Roomba 860 vs Roomba 880, it’s time we make a decision on which one is the best vacuum cleaner between the two. Here, we will focus on two aspects; features and affordability. When it comes to features, the Roomba 880 is the best vacuum cleaner. It offers superior performance in terms of cleaning. It also has a powerful battery that can last it for 90 minutes compared to the 860 which can run for 75 minutes average. The Roomba 880 also has two Virtual Walls, multiroom cleaning, a remote control among many other features. On the other hand, in terms of pricing, the Roomba 860 takes the day. It costs less than the Roomba 880 although it has lesser features. So, when you are looking for performance, the Roomba 880 is the best choice. If you are on a budget, however, the Roomba 860 is still a great deal!